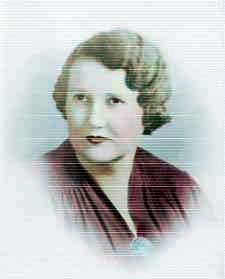 Delia Elizabeth Myers was a lovely young woman with black hair and dark brown eyes. She was born and grew up in DeWitt County, TX, not far from where the first of her DeWitt County ancestors lived in 1828. Her real name might have actually been Ardelia Elizabeth, rather than Delia, because that was the name of her grandmother Shanks. She, like her mother, had an independent spirit and felt confident of being able to do what she set herself out to do. When she was seventeen, she married a young, sweet-talking Georgia man who made her laugh. Even though she followed the role of the traditional woman of her time--being a wife, mother, and manager of her household--she was very capable of doing things on her own. For instance, she thought nothing of getting on the train in Kingsville in the early morning hours, going to Houston for the day to go shopping and to the movies, and then taking a return train back to Kingsville that evening. Her husband, Farland George Roper, was a railroad man, and for men who worked on and drove the trains, there were many days in a week when he would be gone. It fell on Delia to take care of the children and the household whenever he was away. Once the children were gone, if the time should come that his base was somewhere other than Kingsville, she would close up the Kingsville house and move to whereever he was based. They would live there for the time he was working and then move again as his base changed. She loved to play the piano, she taught and was President of her Sunday school class for 30 years and had a real gift for math. She was able to add several columns of numbers in her head, and she was always right. When queried about this ability, she just said, "Oh, it's something I've always been able to do." One of her laments of old age was that she could no longer see well enough to do her beloved crossword puzzles. In her 70's she was a serious threat at games--especially Scrabble and Spite and Malice. She used to love to play canasta and even regularly played a three deck canasta game called Samba with her friends at the senior retirement center. Delia was a loving, giving woman who always had some parts of her family around her. When she and Farland were younger, they took in nieces and nephews when other family members needed help. During World War II, the war brides and widows came "home" to live. Many times grandchildren would need a place to stay for a year or two and they were welcomed. Even as the grandchildren reached adulthood, they sometimes would need a place to live while going to school or getting started. Delia was the one who would be more than glad to take them in. She loved all the children and even enjoyed having the great-grandchildren around. Family meant everything to her. On her 90th birthday, a birthday celebration was given for her with so many of the children she had raised attending. Her words about the birthday party where so many of her family surrounded her sums up how she felt about all of them. At the end of the day, she said, "This is the happiest day of my life." A book is being written with more detail about the lives of Farland Roper and Delia Myers. A Thumbnail Biography cannot tell it all. Would you like to add something to Delia's Thumbnail Biography? E-mail me! Farland George Roper, the husband of Delia Elizabeth Myers, was a young man brought up on a farm in Dawson County, Georgia. We do not know why he moved to Texas. It seems that the daughters of the family moved to Atlanta and possibly he did not want to stay on the farm. Or it is possible the Army brought him to Texas. It was there in San Antonio, Texas, that he met Delia. It was enough to make him stay in Texas for the rest of his life. 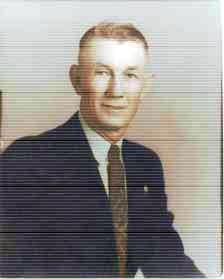 According to his Railroad Retirement Records, Farland was born in Yellow Creek or Dawsonville, Georgia. Most genealogy research shows that his name was actually "George Farland", but family stories say that he changed it to "Farland George" when he went into the Army because he did not want to be called "George." Farland was a fun-loving man. Everyone who knew him loved him because of his wonderful sense of humor and the ability to make people around him happy. Farland had a "gift of gab". He was always making up and telling stories--usually outrageous ones. He loved music and encouraged his wife and children to sing and play the piano. He could play the piano by ear, and many nights would be spent around the piano singing, while he "banged out" the melodies. The Roper men seem to have several traits in common, according to a distant cousin from Pickens County. They all could charm anyone--many of them became preachers. They liked to sing and tell stories and entertain a crowd. Farland was just like them, as is his son and a couple of his grandsons and great-grandsons. He also loved to dance to the music of the hills of Georgia. He could "clog" with the best of them--not the kind we see now with partners dancing as in square dancing, but as they did in the "old days"--the men taking to the floor and "clogging" by themselves, competing with each other for attention and the love of music. One of his favorite songs was "Casey Jones" about a railroad engineer who died with "his hand on the throttle" and we would sit around and sing "My Grandfather's Clock." And he could tell a story--especially the scary ghost story that would have the grandchildren quaking in their boots, but loving every minute of it. Farland started working on the railroad in 1921 as a stoker and worked his way up until he became an engineer, first on steam locomotives and lastly on diesel engines. He would work on the railroad until he died. He loved the engines and enjoyed taking his grandchildren down to the RoundHouse in Kingsville to look over "his train." His family remembers him as a man that they dearly loved. They all have tales to tell about him, repeating his stories and telling of his antics. He was a good father and a good grandfather. He left a legacy that makes those who knew him smile as they recall the stories. The Roper family originally came from England. After first settling in Virginia, many of this line migrated to North Carolina and finally to Pickens County, South Carolina. The information given here has not been confirmed by the writer but has been found in different sources, mostly from "Some Southern Roper 'Trees' A Book of Clues" by June Roper Walton, Compiler, "Georgia Clay" by Carolyn Hyde, and oral information by e-mail from Billy Roper, a relative descended from the Alfred Roper line, who lives in Pickens County, Georgia. As the sources are checked, this biographical sketch may change. The first in this line of relatives found in South Carolina was Aaron Roper. Continuing this particular line was Aaron's son Tyre Lewis Roper who lived all his life in Pickens County, South Carolina. Tyre was a wealthy landowner before the Civil War and one in a long line of ministers in the Roper family. Tyre was married to Malinda Edens in Pickens County where they had nine children. Malinda died before Tyre and he remarried in his 70's. His new wife was Darcus Jane Moseley. It is said that his first family did not get along well with Darcus and there was ongoing strife. Additionally, after the Civil War came a period of great unrest in South Carolina. The Reconstruction Era, from 1865 through 1876, did not go well for the Southerners. There was still much hostility and political corruption, along with the carpetbaggers from the North. Therefore, between 1873-1875, Samuel Roper, along with his two brothers Amos and Elijah, and his wife Louise Castle (or Cassels), decided to take their children and to migrate from South Carolina to Pickens County, Georgia. There they settled and built their own community along with the Blackwells and the Dobsons. The brothers all settled in the Yellow Creek District, which runs through Dawson and Pickens counties. All of their lands adjoined each other. After Samuel and his brothers moved to Georgia they, along with their neighbors established and built their own church in 1884, on land donated by Samuel Roper. Carrying on the tradition of the Ropers being preachers, he was also one of the ordained ministers of the church. Samuel and Louise's son, David Elijah, was their 7th child. David married Cynthia Isabel Hudlow who was born in Georgia. They had five children, including George Farland Roper. Farland was born in Dawson County, but the census of 1910 still shows it as the Yellow Creek District. However, people who still live in Pickens County, Georgia, today remember David's family and it seems that the two counties are thought of as the same place. David is shown in the census to be a farmer and ten years later he was still farming, but now in Milton County. David and Isabel's family seemed to have moved off the farm, with the daughters moving to Atlanta and Farland to Texas. Milton County is the county in which the family must have still resided up until their deaths because Farland visited his family here after his marriage. His second daughter, Mardell, was born here in Alpharetta, GA, much to Delia's chagrin. She told this writer that she was really unhappy about traveling so far in her pregnancy, and she was proved right! Here too, their daughter, Ruth Elizabeth, died of an intestinal virus which could kill young children quickly in those days. This writer hopes to discover more about this family in the future and will post it here as it is known.